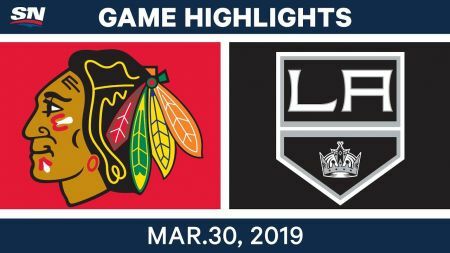 The Los Angeles Kings only have one more week of action left during the 2018-19 National Hockey League season, but on March 30, they came away with a dramatic 3-2 overtime win over the Chicago Blackhawks. This game had a significant amount of meaning for Chicago, as they are still in the hunt for a playoff spot in the Western Conference, but on this night the Kings prevented the Blackhawks from recording the full two points. Here are the four best Kings plays of the game. 1) Three great saves from Jack Campbell-- In the first period, Campbell got his blocker up to make a great save off a shot by Blackhawks right winger Alex DeBrincat, who has had a breakout season with 41 goals. In the third period, Campbell made a key shoulder save off a shot by Dylan Strome. Then in overtime, Patrick Kane was in all alone but simply could not beat the Kings goaltender. 2) Wagner shows off marvelous speed in scoring Kings goal--With about four minutes left in the second period, Austin Wagner skated with a burst of speed up ice through the neutral zone and past Blackhawks defenseman Carl Dahlstrom in the Blackhawks zone. Wagner then scored past Blackhawks goaltender Corey Crawford to tie the game at one. 3) Great pass by Trevor Lewis--With just over four minutes left in the third period, Michael Amadio received a highlight reel backhand pass from Trevor Lewis and tied the game at two goals apiece. Lewis's pass came from the goal line and was tipped by Kyle Clifford. 4) Slap shot winner by Drew Doughty-- With 12 seconds left in overtime, the Kings all-star defenseman Drew Doughty received a pass from Anze Kopitar and then rifled a slap shot past Crawford to win the game 3-2 for the Kings. For Doughty it was his fifth career overtime goal. The Kings next home game is April 1 when they host the Calgary Flames at Staples Center. Get your tickets today!